Summer is full in affect and with that comes the demand for climbing the higher peaks around the Pacific Northwest. 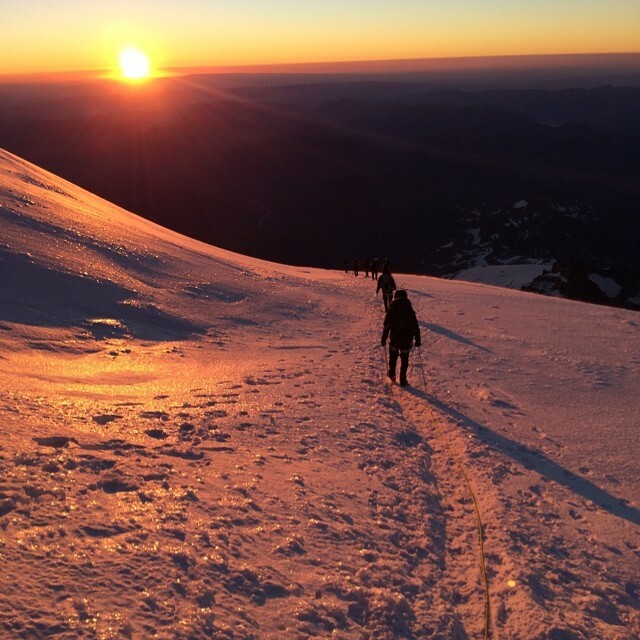 I recently helped lead a group of 6 up Mount Rainier (14,441′) and Mount Baker (10,781′). Anyone who knows me knows that I like to explore new peaks throughout the Cascades but I end up climbing some of the more popular ones a few times a year. They are both magnificent peaks so it’s kind of a win win either way. Plus the real joy is watching others achieve their dreams. Each person I connect with on these climbs has different backgrounds and goals so it’s always interesting to get to know them and their approach to attacking such an endeavor. The one commonality is the desire to succeed. The summit is the ultimate goal but success doesn’t necessarily lie on top of the mountain. And it’s unique with each person, but it really comes down to the life experience they safely walk away with from the mountain. Preparation is imperative for climbing a highly glaciated peak while attached to others on a rope that you are trusting with your life. The mountains are always a humbling experience, no matter how experienced you are. And things happen fast. With the crowds on Rainier one individual on my rope slipped on the warming snow and before he knew it he was heading for a crevasse. Fortunately I had a solid team and we performed a textbook self arrest (drop and dig the ice axe and crampons into the snow) and anchor (establish a strong hold with an axe, picket or ice screw to anchor the rope) to stop the ascent and get the team member back to safety. On the Baker summit we ran into a young guy without a harness or helmet, who was planning to ascend alone due to his climbing partner taking a different route out. I wasn’t about to let that happen so I created a bowline in the middle of the rope and helped get him down to safety below the heavily crevassed Coleman and Demming Glaciers. We were fortunate enough to summit both mountains and, as usual, it really came down to one thing; placing one foot in front of the other. At altitude, wearing heavy packs and awkwardly traversing glaciers and steep slopes through the cold dark night there are millions of reasons to turn back. But you’re there for a purpose and it’s about finding the one reason to take that next step. Sure it would be easier to turn around and allow gravity to help in the descent, but if you took that approach in life then you’d never accomplish anything. You can always turn around, but why not push beyond your ‘perceived’ limitations and see how far you can go. If there are objective dangers or physical conditions that are truly threatening your life then of course you need to turn back, but if it’s a mental barrier then reach deep and push through it. That’s when you’re truly living life. And eventually you’ll reach the top and it’ll be an accomplishment you’ll never forget. You don’t have to climb a mountain to use this tactic as it applies in almost anything we do in life. Whatever barriers are holding you back, place one foot in front of the other. You’ll eventually reach your goal(s) and become the person God created you to be.